This plugin will replant trees when they are cut down (or burnt down), and will keep it the same tree type. It also will take down an entire tree when then bottom log is removed depending on whether it is enabled in the config. Should be self explanatory. Use notepad+ + if you have issues reading .yml format configs. The list of tools types can have anything added to it. Use 'AIR' to include fists. Click here to see an example config with some info on whats-what! /treeassist toggle - lets a player turn TreeAssist auto destruction on or off. 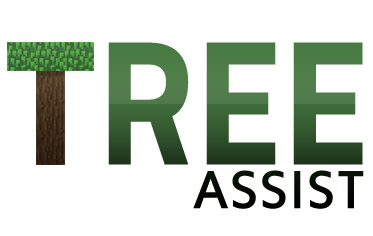 treeassist.replant - When the player chops down a tree, should a sapling replant itself? See the full change-log here! Notice that the comments are gone? Like the plugin? Help me keep my programming hobby alive! Please consider donating! To determine popularity and usage of TreeAssist, plugin installs are automatically tracked by the Metrics plugin tracking system. If you don't want this tracking, edit plugins/PluginMetrics/config.yml and set opt-out to true.